Bible Story Word Search Fun: An Augmented Reality Wipe-Clean Book is a great way to get your kids excited bout God's Word. While learning about 10 different Bible stories, your children will experience a whole new dimension in solving word search puzzles! You can download the free APP, compatible with any mobile device, and then watch as Bible stories come to life as your kids locate each word in the puzzle. This gaming book/APP duo will entertain learners for hours as word search puzzles are re-scrambled again and again for additional learning fun. The wipe-clean workbook is a perfect stand-alone product, as your kids can use a dry-erase marker to solve each puzzle and then wipe the puzzle clean for even more learning fun! Bible Story Word Search Fun is perfect for home, church, and travel! 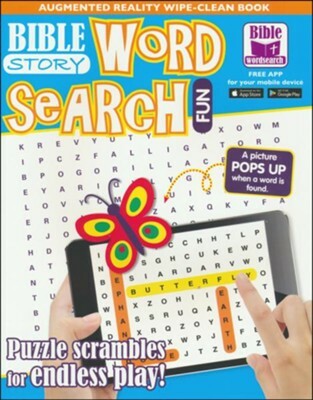 I'm the author/artist and I want to review Bible Story Word Search Fun: An Augmented Reality Wipe-Clean Book.